I often wonder what our business would look like if we didn’t have the internet to supply us with customers. In this case, James is a local, so his experience might give a little insight. 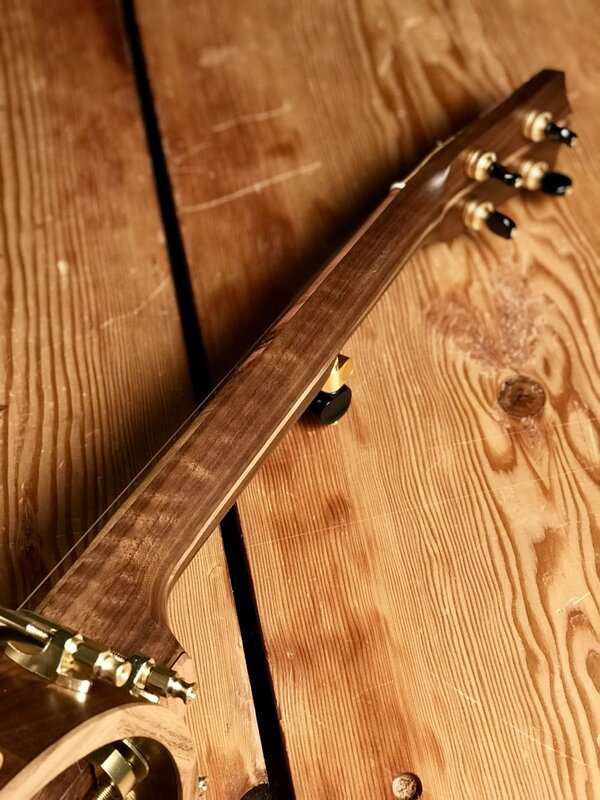 To begin with, this instrument was bartered for, which is hard to do long distance. Also, he came over to the shop and picked out wood, which can’t happen with every customer. Lastly, if it ever needs repair or adjustment, he can just drop by instead of having to ship it. 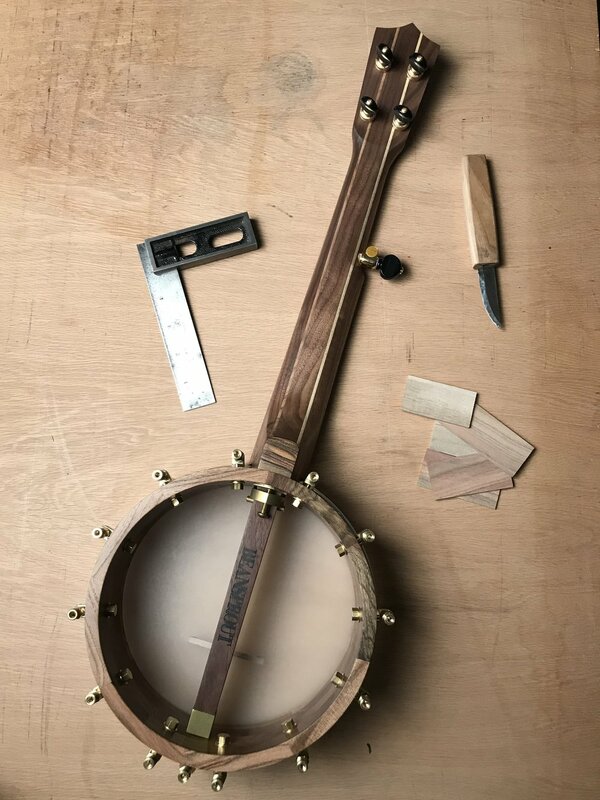 But, if I only built banjo ukes for locals, I have a feeling I wouldn’t get to build as many! This lightly curly walnut is urban salvage from Goby in Portland. The beautiful green/gray/brown pistachio is from California Orchards. 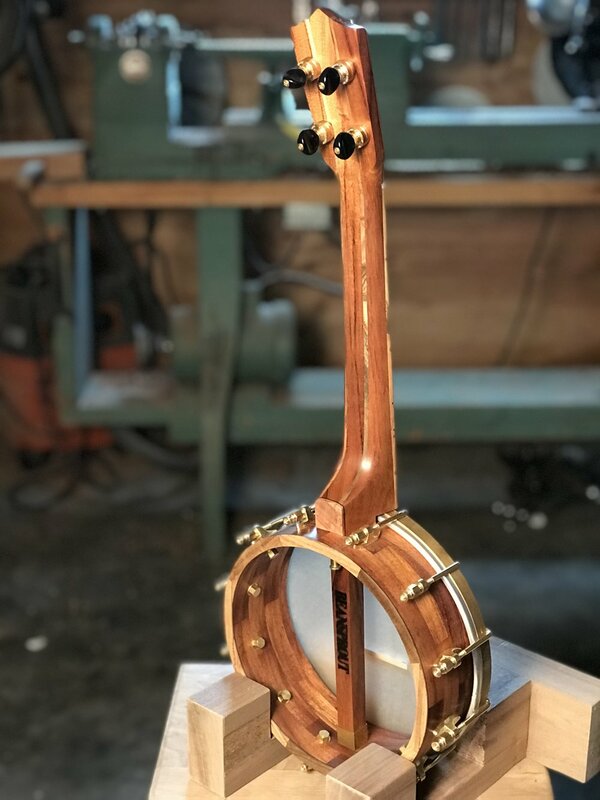 A banjo uke made from Koa? Why not. The koa is from the Carpenter Ant Stash, from a pile of boards that Lizann’s grandfather made clocks from. The pistachio is from California Orchards. 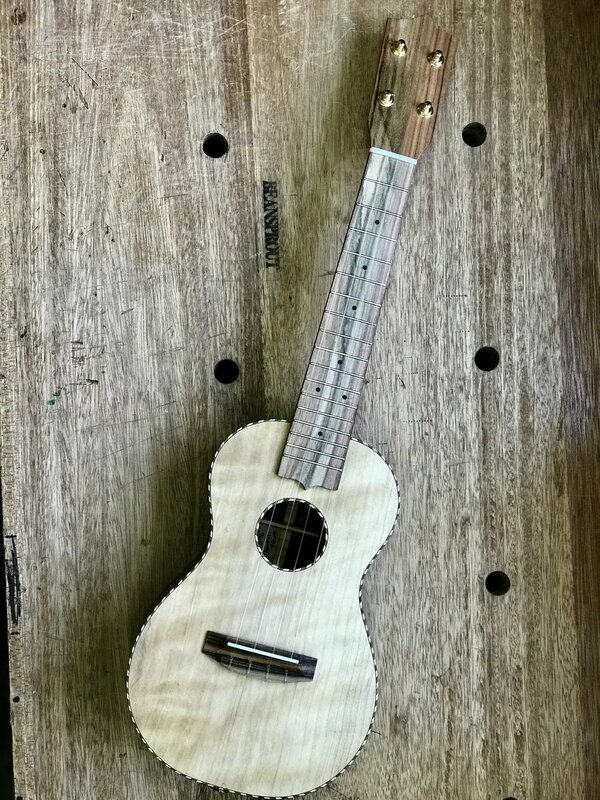 It’s going to Stephen, who has a wonderful connection with the date this uke was finished! Sometimes, it is easy to get distracted by the many paths (and woods) we have before us. When that happens, I feel good about falling back on the tried and true, the classic designs. My four year old son Henry defines classic as “old but good” and I think he is right. 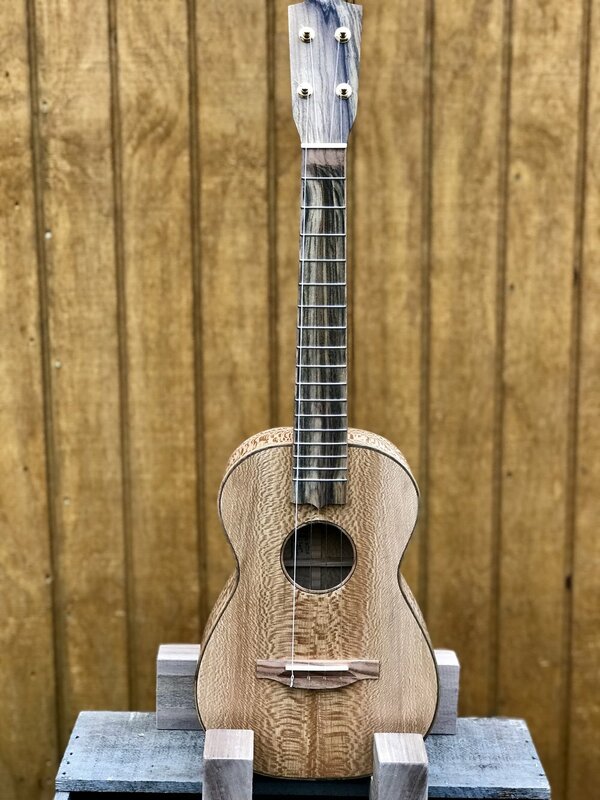 In this case, a koa tenor ukulele with a mahogany neck. Super classic. 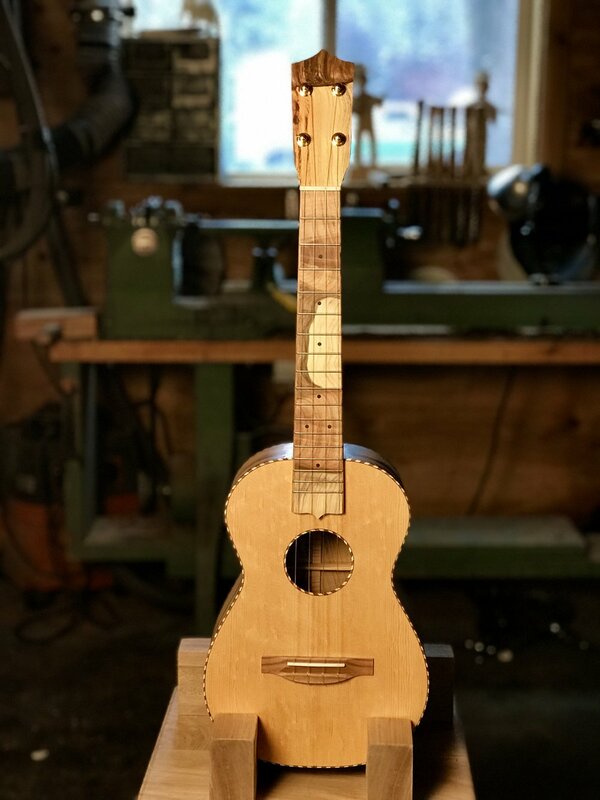 I added the pistachio fretboard, headplate and trim to make it my own, but it falls squarely in line with the long tradition of Hawaiian craftsman that I sit at the feet of. 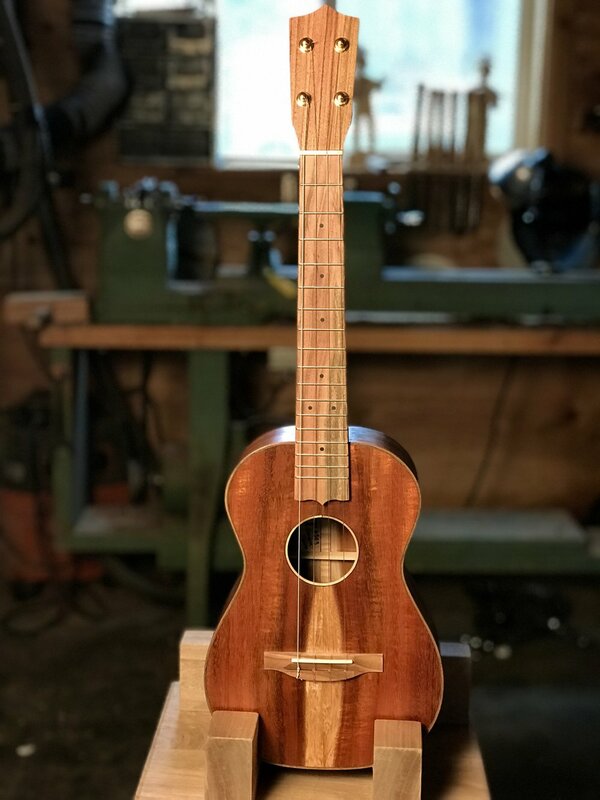 Go play it, Doug, you are a true classic who deserves a classic uke. The koa come from the Carpenter Ant stash, from the boards that Lizann’s grandfather made clocks from. The Pistachio is from California Orchards. The mahogany is salvaged from a fireplace mantle. About 3 years ago, I went to a cabinet maker’s estate sale one town over. His shop was a one car garage and he had no dust collector! The entire place had 12” of wood shavings and scraps on the ground. In one corner, I found a pallet of maple strips cut to 1”x3”x24” and bought them all. I should have bought the oak pallet too! When I got them home, my son Henry had fun laying them out as a dance floor in the shop. He would put a bunch out while I worked and then we would put them away when we were done. Anything to keep a little one busy, right! 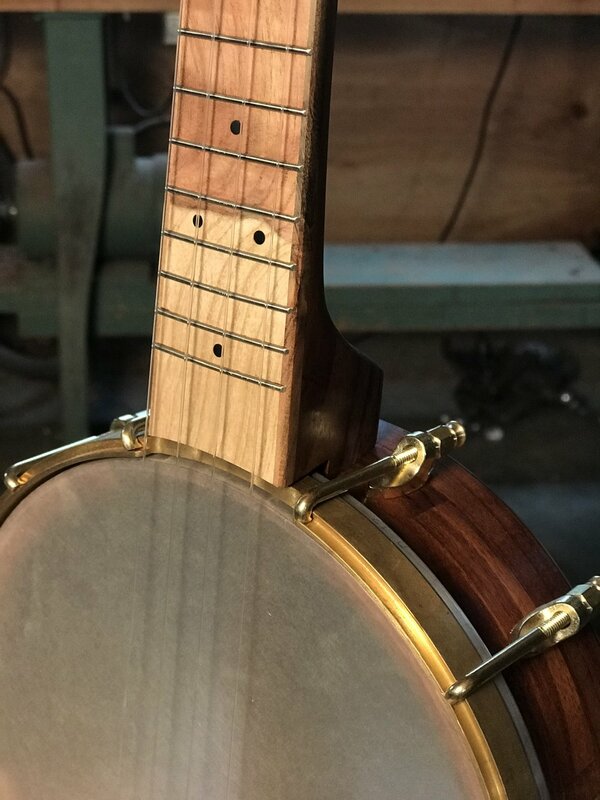 Having these strips already milled lets me see the grain and figure easily and quickly process them into banjo parts. A real blessing. 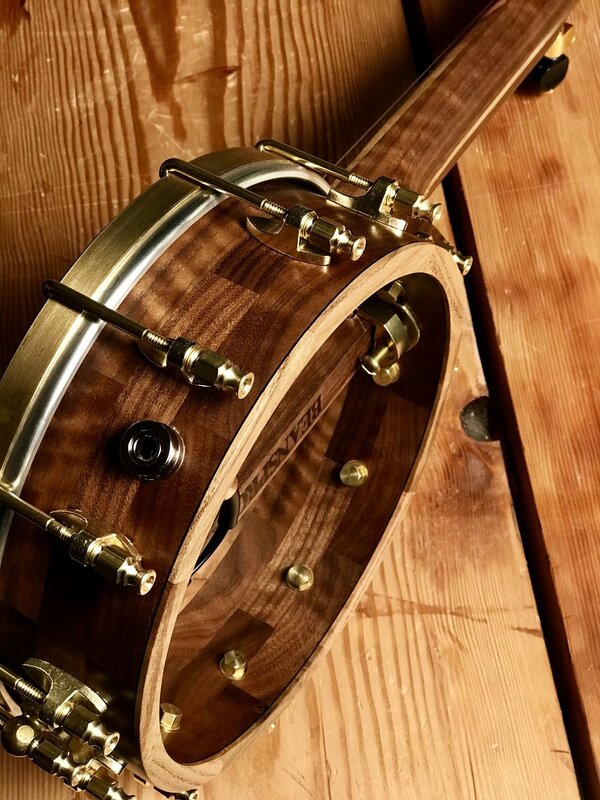 This tenor model with a low G is all Henry’s dance floor maple and pistachio from California orchards. 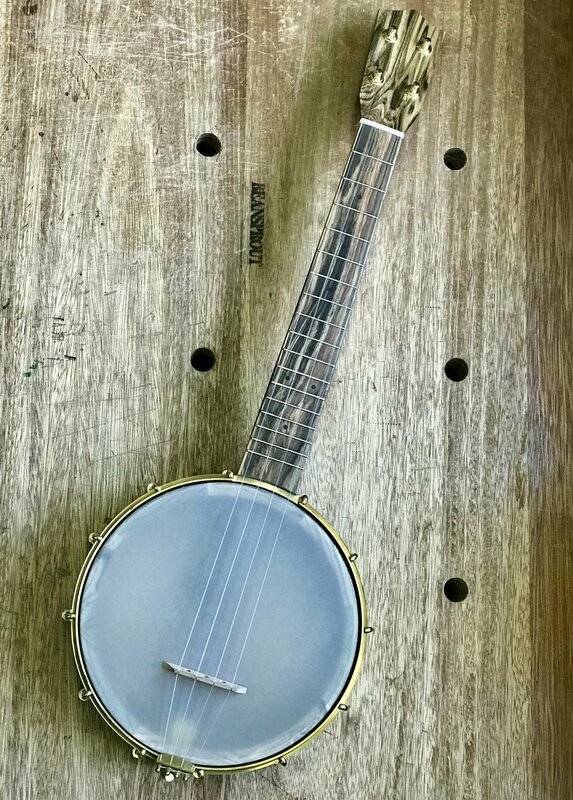 This banjo is a great example of our little global business and musical culture. 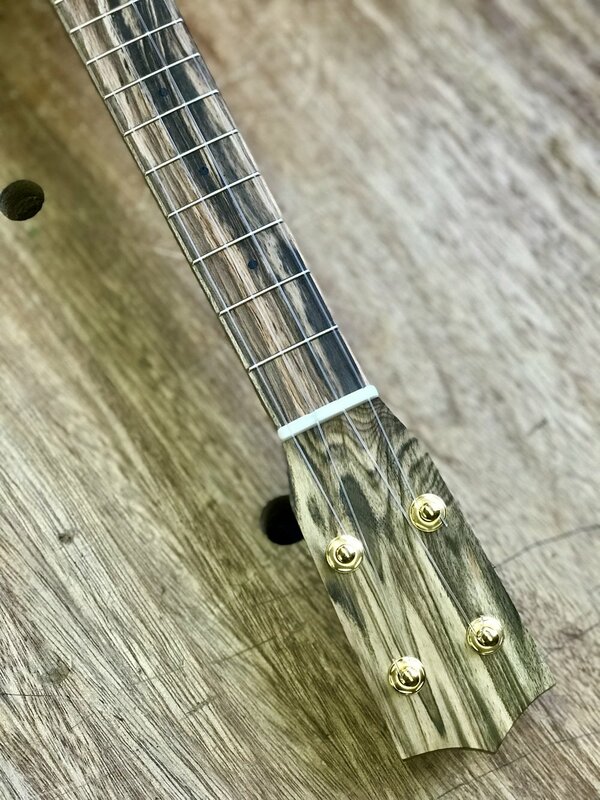 To begin with, it is for a customer who lives a few hours away from us but we met in Alabama at a music camp. 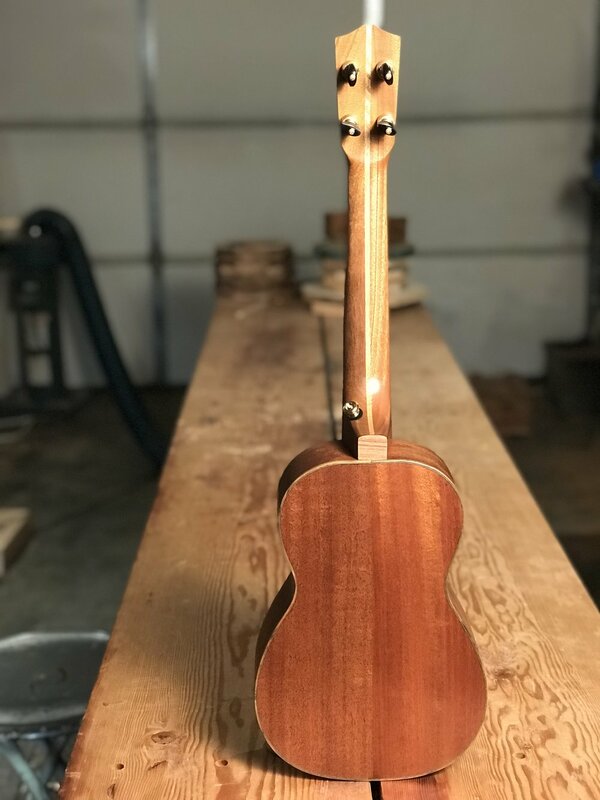 She used to live in Hawaii and we considered grabbing some Koa from her property for the instrument before choosing Oregon walnut and California pistachio instead. 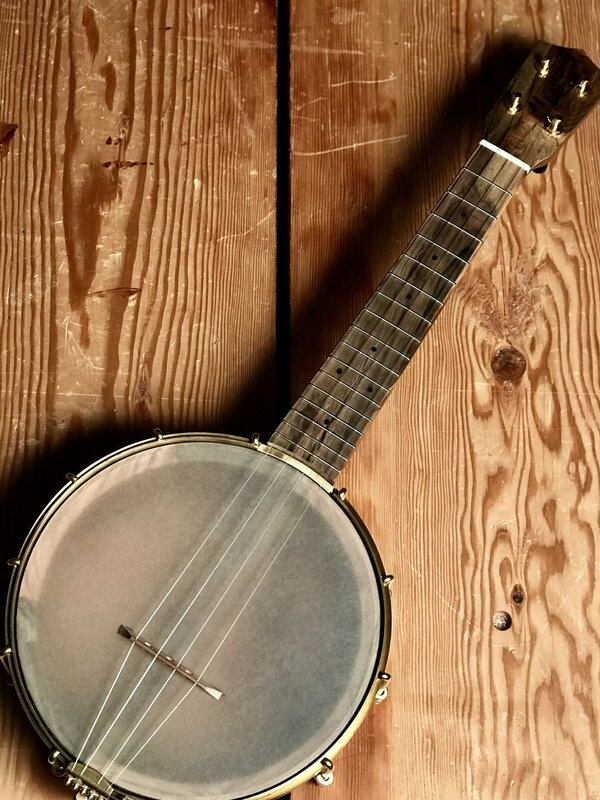 The banjo is an American instrument with clear origins in West Africa. 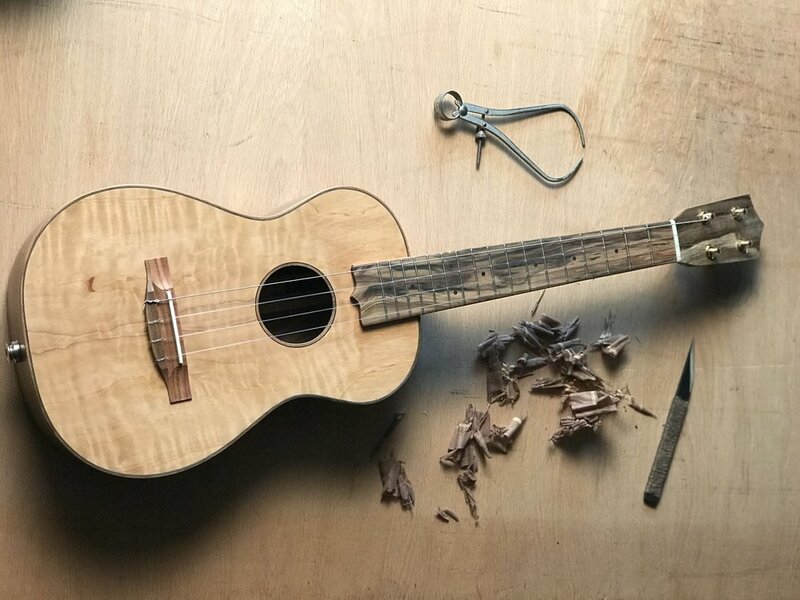 This mini version is scaled down to ukulele size, an instrument that started in Portugal and flourished in Hawaii. 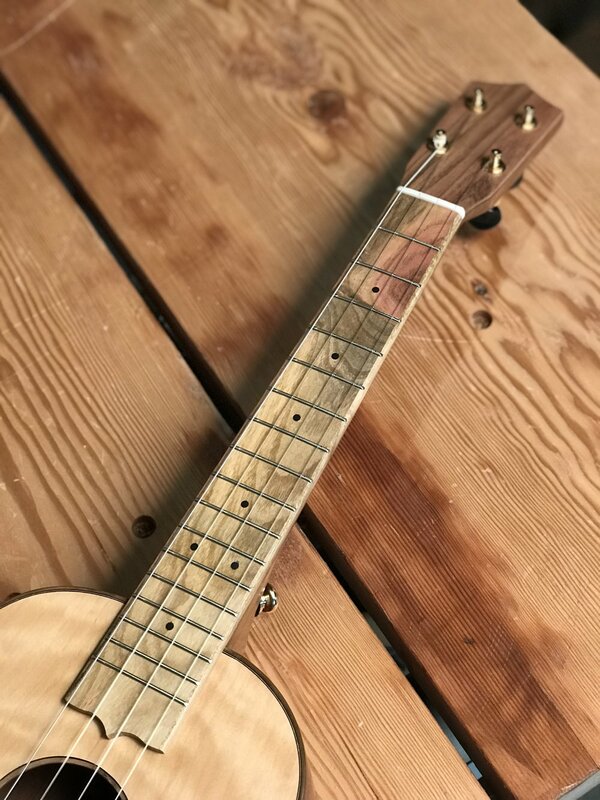 It was made by a guy from Wisconsin who lives in Oregon and plays Appalachian music on Hawaiian and African instruments. That is one good thing about music and musicians, we like jumping over walls better than building them. 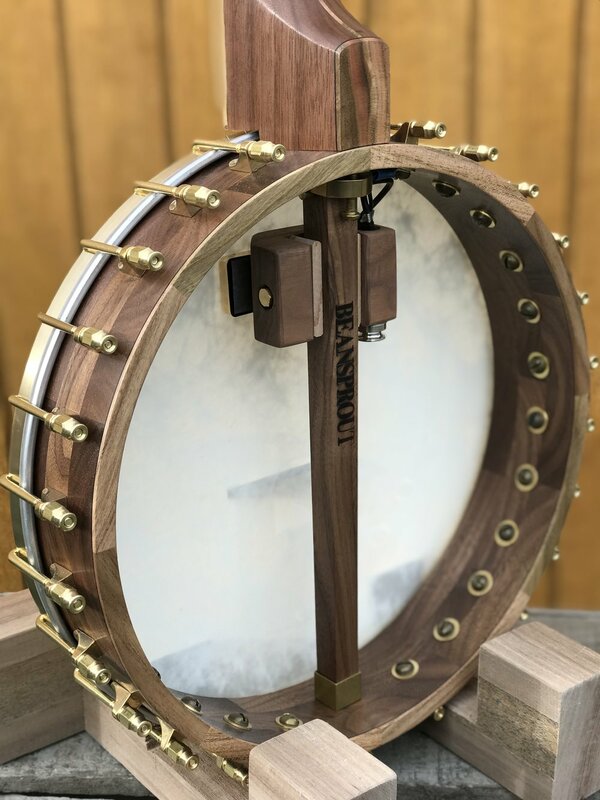 It’s the end of 2018 and this is the last instrument to ship. Even after 10 years doing this, I still need to re-learn the lessons of my past over and over again as I progress. In education, we call this a spiral curriculum; revisiting a concept repeatedly but addressing it with new wisdom each time. 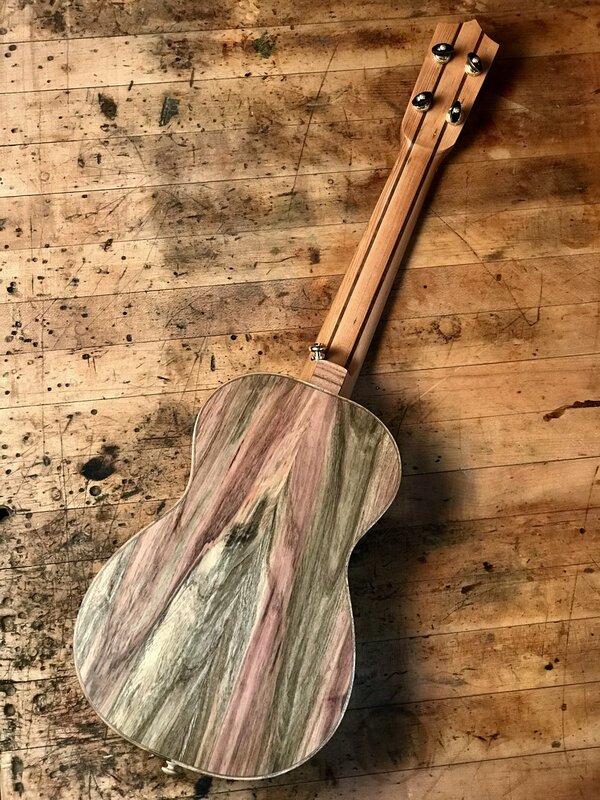 In this case, the customer picked out his pistachio and cedar from woodfromthewest.com. 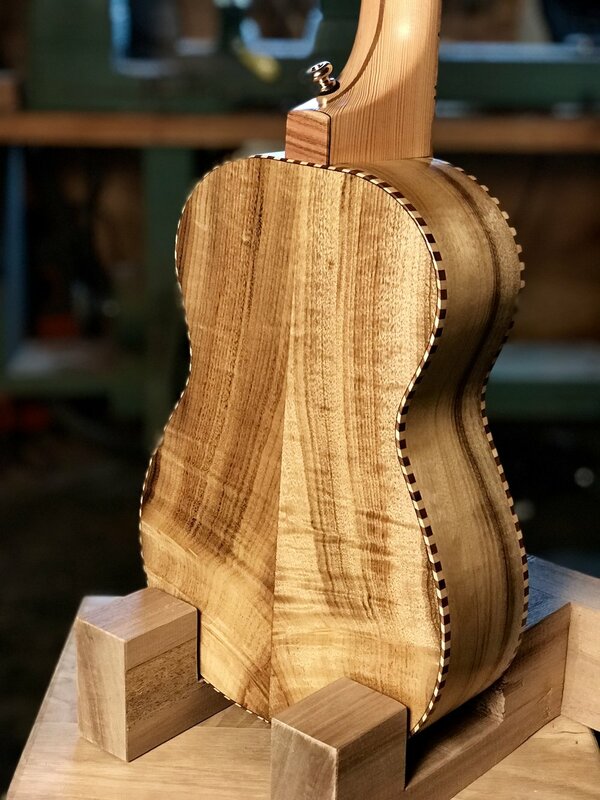 I had a catastrophic accident when routing for binding that destroyed the back. You would think by now that this wouldn’t happen to me, but sometimes wood has a mind of its own and it doesn’t get along with rhe router. 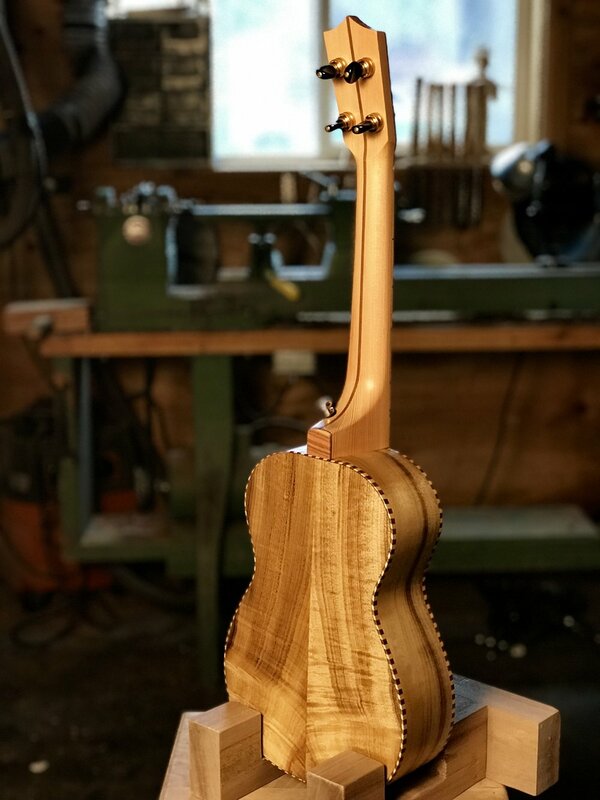 I had to scramble to pick a new back for the customer and get back on track. I heard Gordon in my head with a common lesson from my early days: “it’s better to do it right first than have to back up and do it twice.” Regardless, it was time to double down and deliver my best work, no matter what happened along the way. 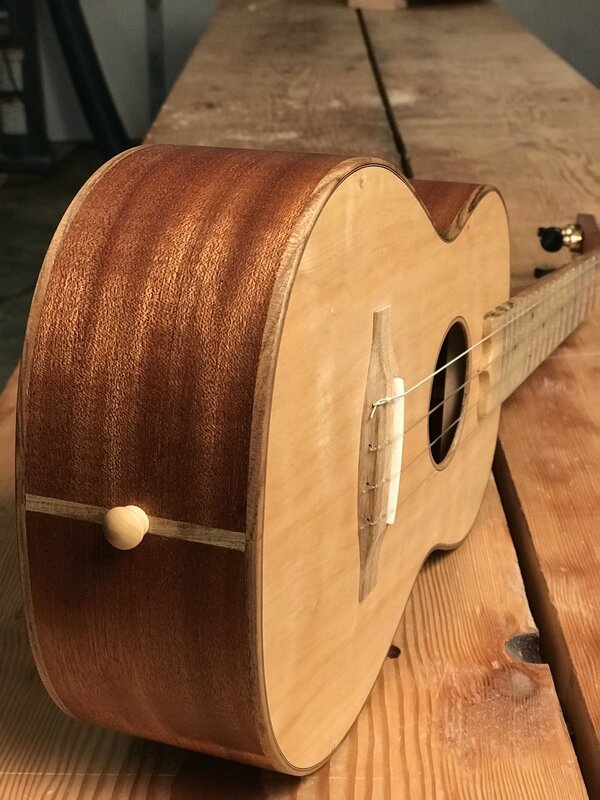 In the end, I am pleased to deliver a tenor uke with good volume, rich tonality and a unique look. Made from materials I believe in with a minimum of environmental impact. 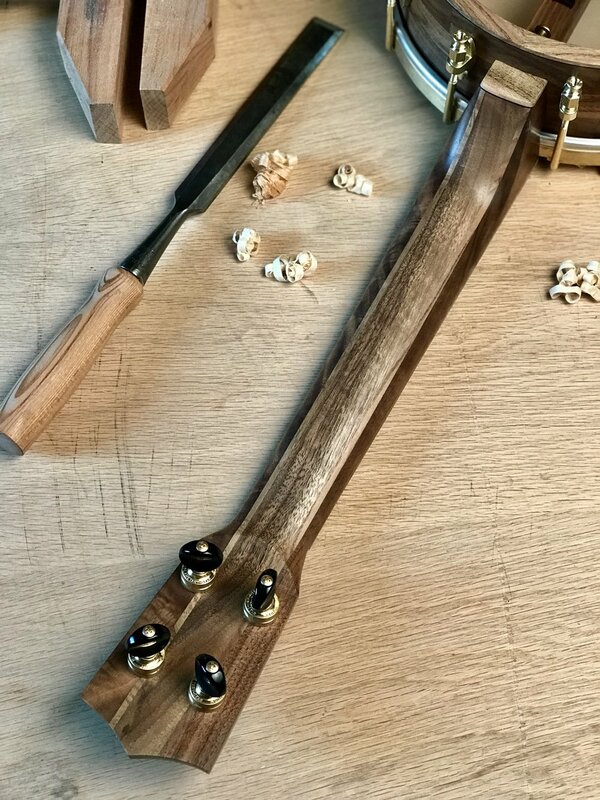 Produced in my own space with hand tools and machines I have carefully collected. Destined for a musical life that I can never imagine. What a great way to spend a year. As a maker, I am in a constant dialogue with my customer, my present self, my ambitions for the future and my past decisions. 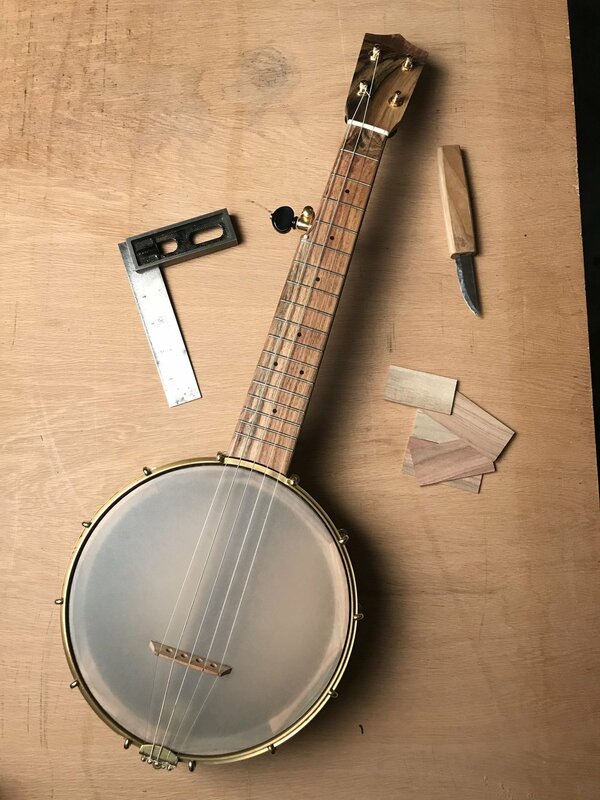 This is most clear when building a second instrument for someone. 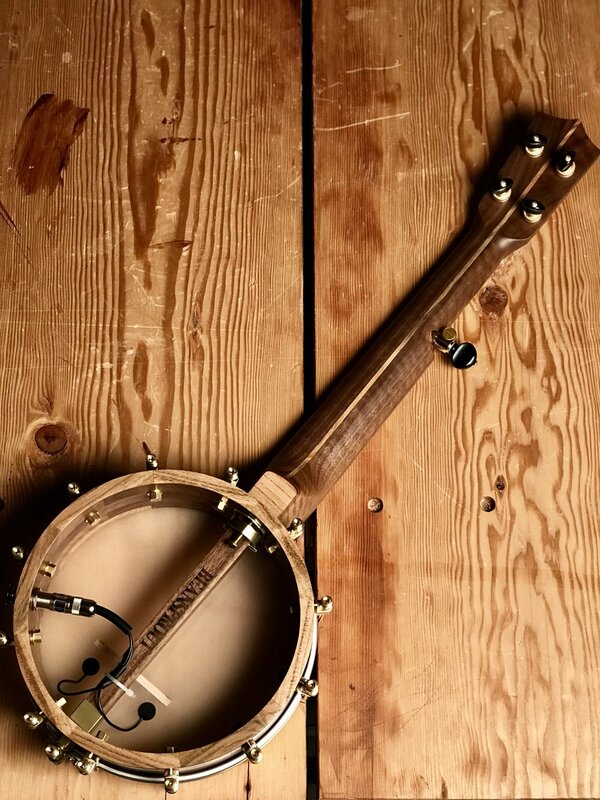 In this case, Steve Varney, who plays as Kid Reverie and with Gregory Alan Isakov, needed a second banjo. I built the first in 2011 and it reflected my skill set and capabilities at the time. Since then, I have had it back for updates and repairs as Steve has traveled the world with Gregory. His input on what he needs and what works on the road has influenced this build, as well as my current values, knowledge and capabilities. 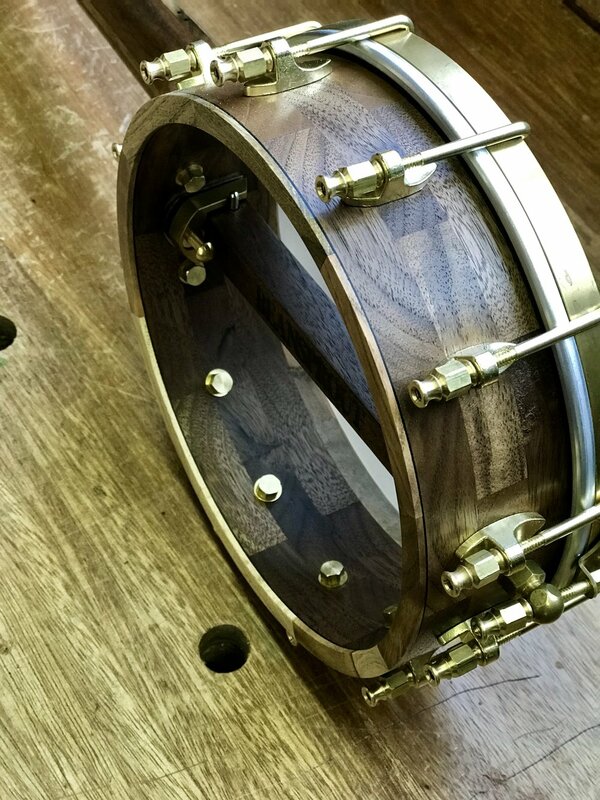 -11 3/4 walnut block rim with rolled brass tone ring. This was the first big rim I ever turned on my new lathe. 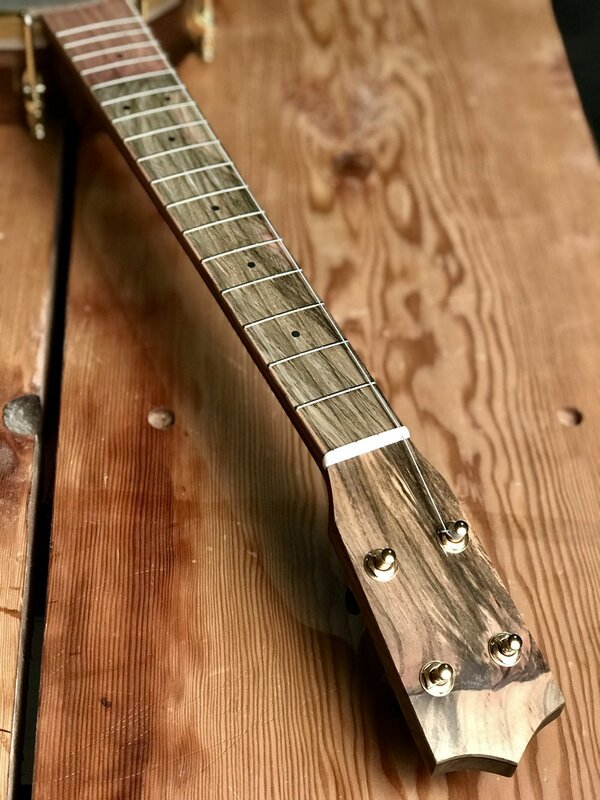 -Walnut neck with 25.5” scale, 20 frets on a pistachio fretboard. 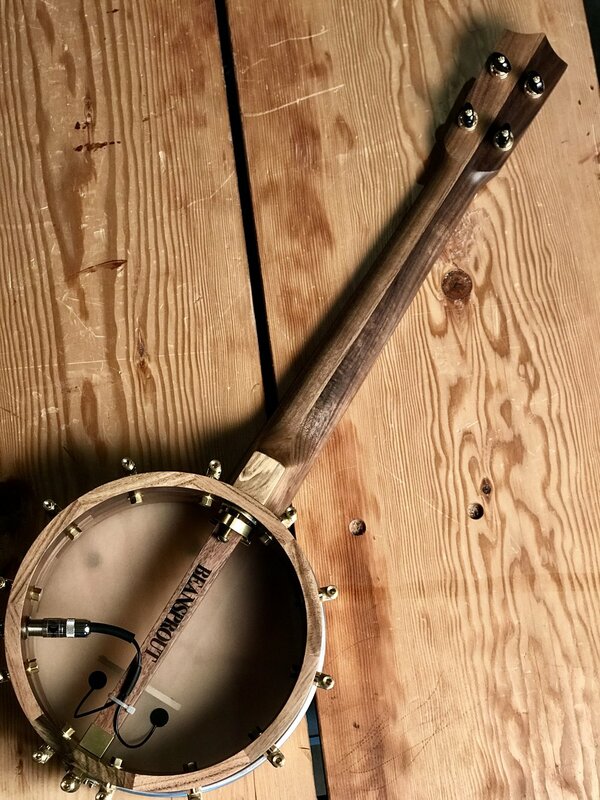 -Hawktail tailpiece from Balsam Banjo Works for extra downward pressure. 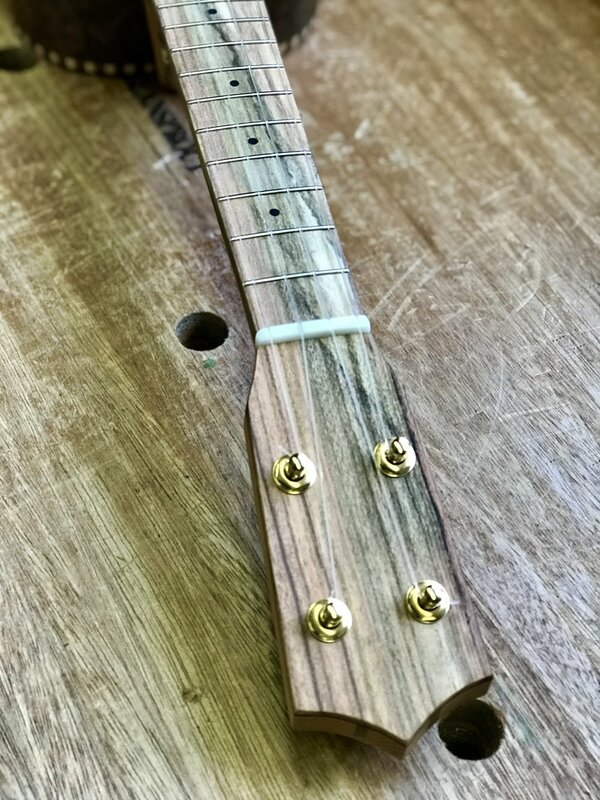 -Mini humbucker pickup, contained in a custom wooden block behind the dowel stick. 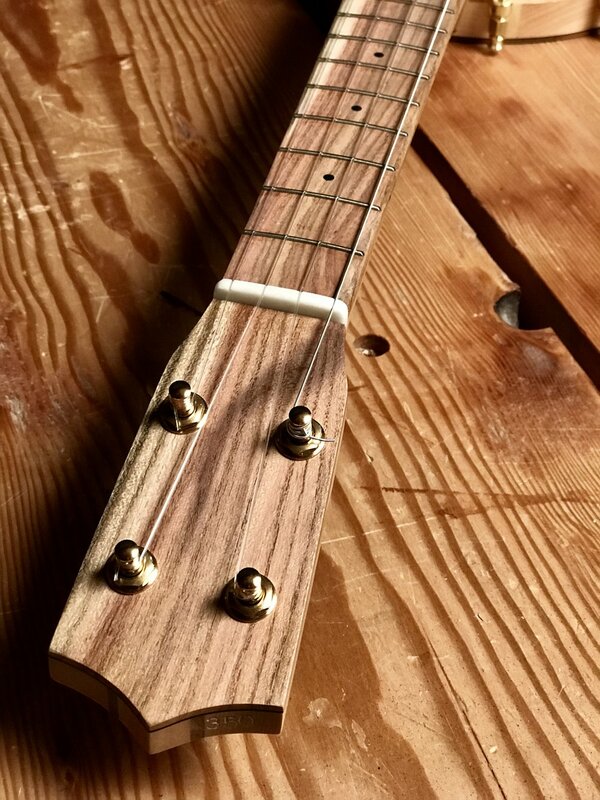 -Fiberskyn head, GHS strings, Gotoh tuners. -Walnut from Goby and Pistachio from California orchards. Many of these design decisions were outside my norm, but led me to new places. What feels special about this is Steve’s place on the stage in front of thousands of music fans. He connects me to this energy and I put more into it, realizing the stakes are higher. 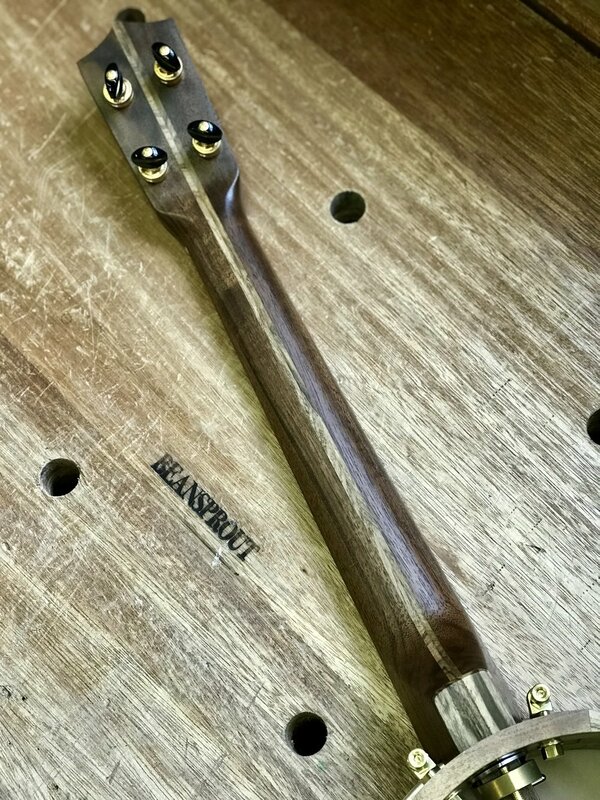 Of course, I want my couch strummers and weekend warriors to get my full attention when their instrument is on the bench, but this symbiosis with a touring pro radiates our to their build as well. The extra effort is worth it. 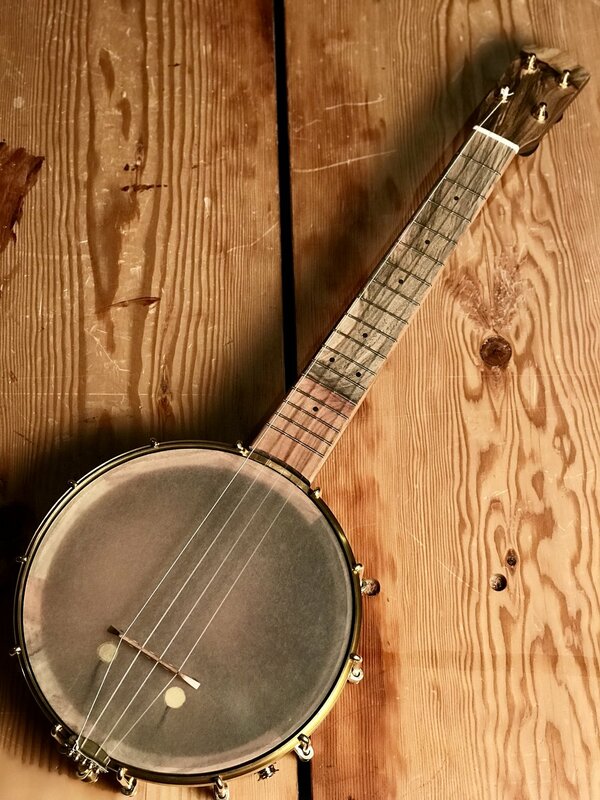 If Steve feels better playing the banjo, Gregory feels better singing the song, the crowd has a better experience and some person’s heart is healed from the beautiful music. We road dogs and dust devils just keep trying every day, maybe tomorrow will be better because of it. 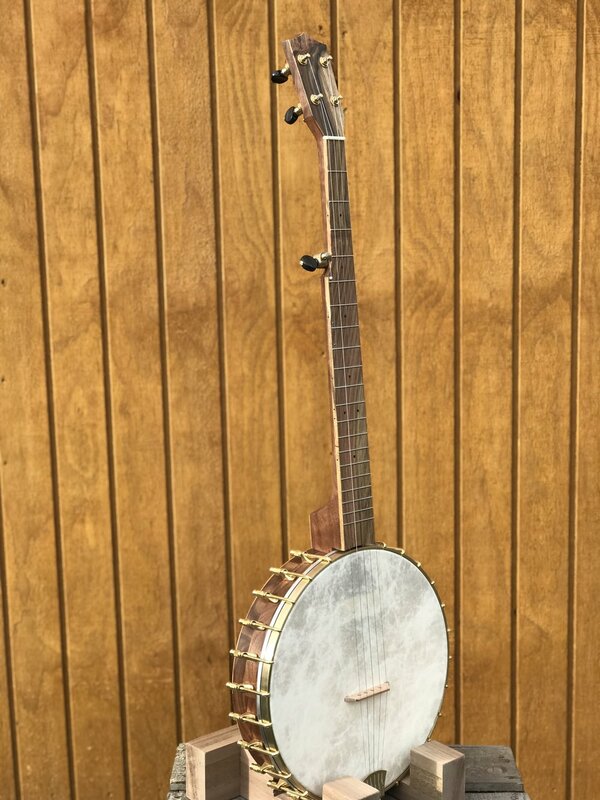 Since I started building banjos I have always tried to buy and stockpile the nicest maple I could afford. 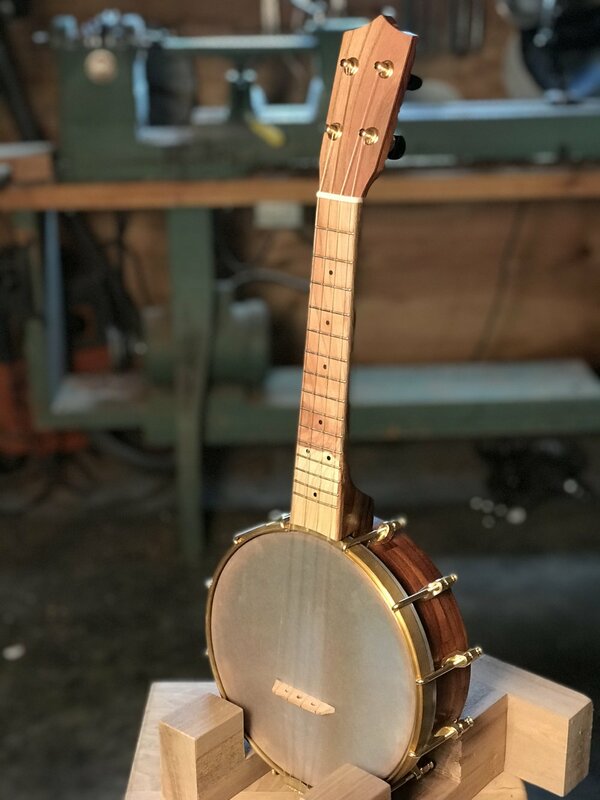 Maple is the most traditional banjo wood, so I figured I would always need it. Since I restarted Beansprout, folks have been picking walnut over maple 4 to 1! Luckily, there is plenty of walnut available in Oregon. This summer I went back to visit Ken and Lizann at the Carpenter Ant stash to grab some more walnut, but I had already cleaned all the walnut out of the shed! We went down to the basement shop and I found a shelf in the corner with cutoffs from years of Ken’s furniture projects. 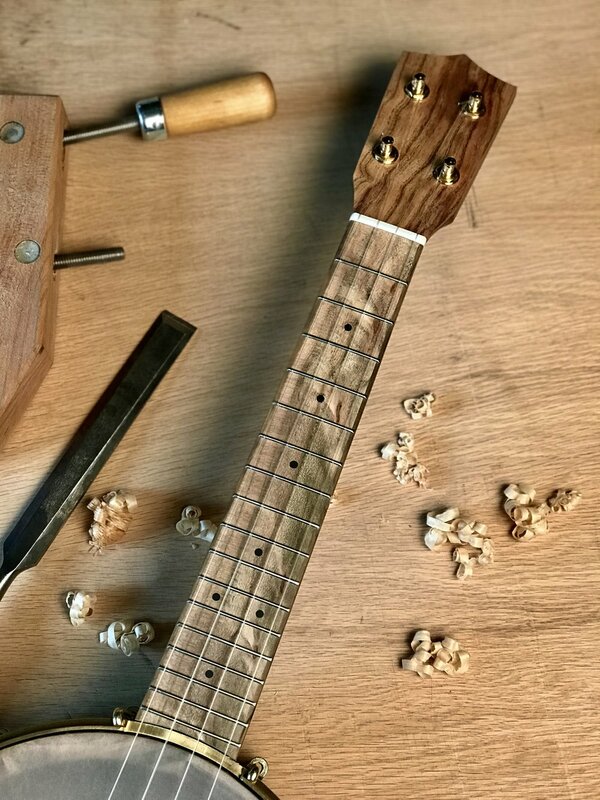 There were three boxes of chunks of Oregon walnut, too small for furniture but perfect for the little banjos I build. Each cutoff was from a different board and project, so every color and grain pattern was represented. 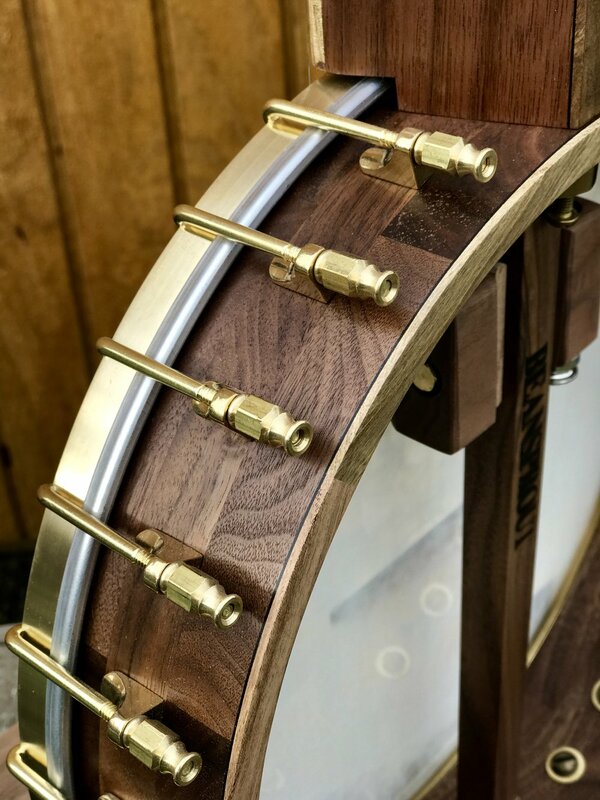 This makes this current batch of banjo rims more interesting to look as well as ecologically and economically sound. Wrap it all up in Pistachio from California orchards and this one is ready for service. All of these have been updated and copied, but the basic design is classic and solid with a well earned reputation. 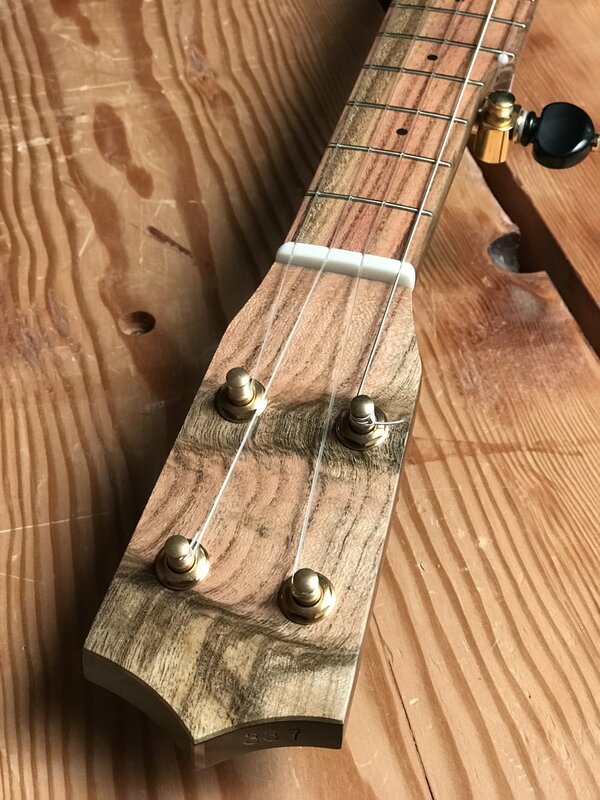 It seems the walnut tenor scale banjo uke is currently my most popular tool, sent all over the world to be useful and beautiful for any style of music by any sort of player. 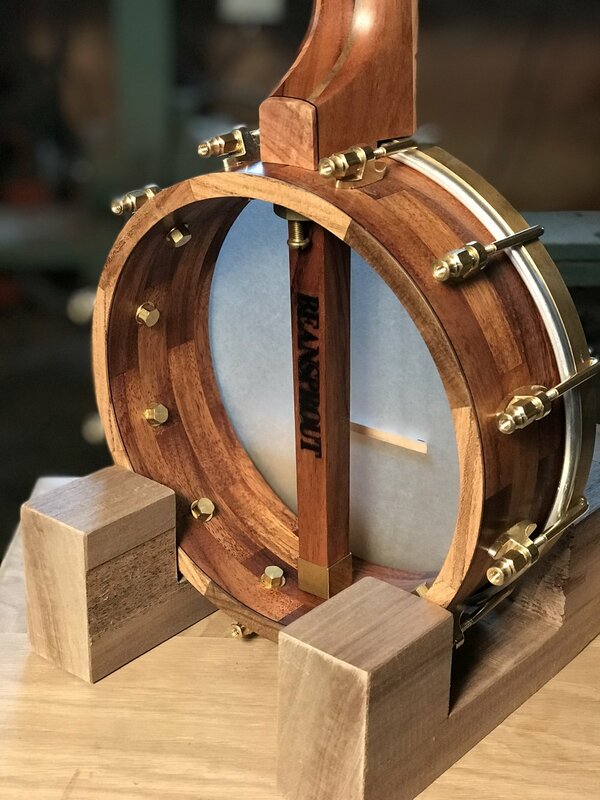 This one, like all it’s comrades, uses the same materials: Oregon walnut, California Pistachio and brass from North Carolina. If you look closer, it is unique of course, with its own special details, but still contained with in its (hopefully someday) classic form. 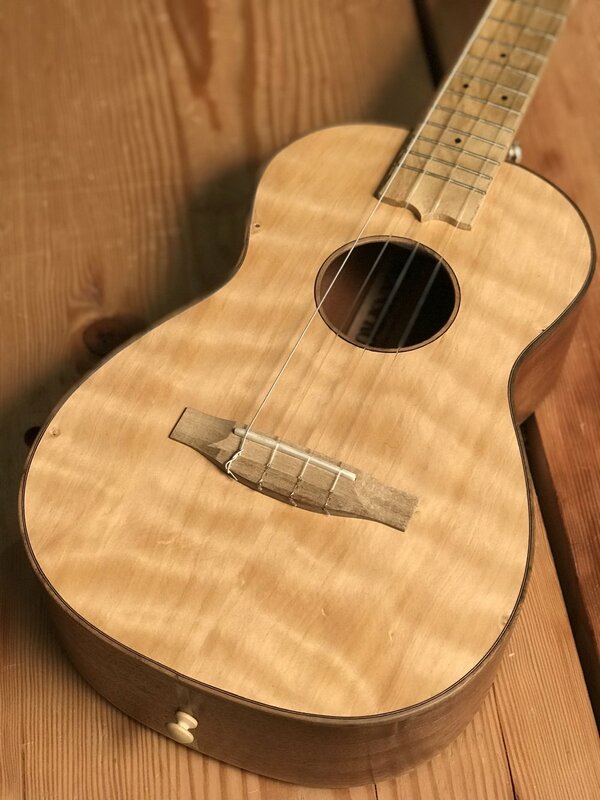 Traditionally, ukuleles were made of all one wood for the top back and sides. 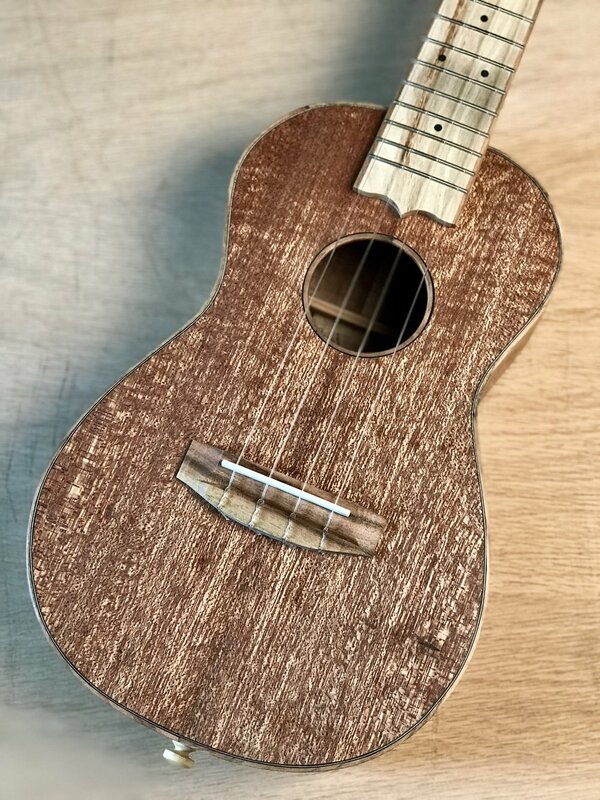 On the islands, this was often Koa while mahogany was a good substitute on the mainland. To make this format work, you have to pick a medium density wood that is suitable for the top, back and sides. In this case, American Sycamore works great. 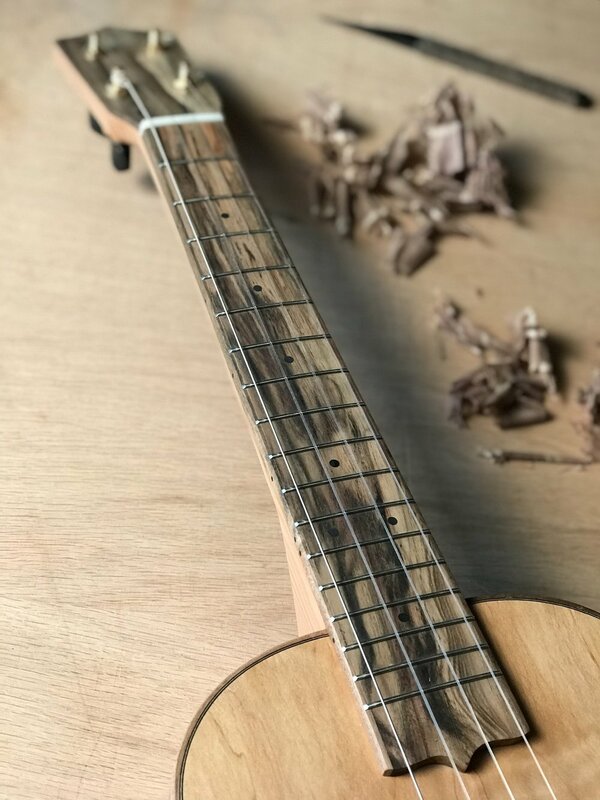 It’s a traditional ukulele sound, but a unique look from an easily obtainable wood. I love how sycamore looks rather plain and classic from far away, but pretty psychedelic up close! 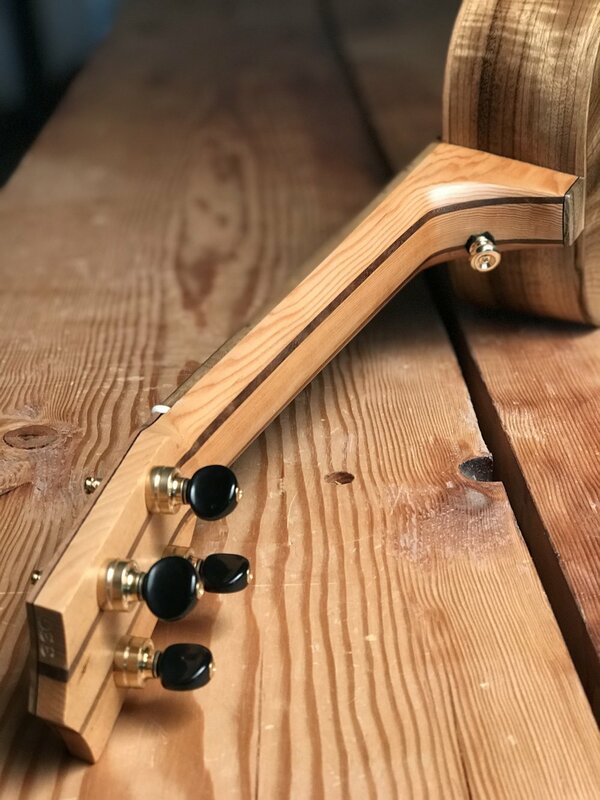 In this case, the sycamore comes from The Carpenter Ant stash in Portland, the fir neck is salvaged from a pig farm in The Dalles, OR and the pistachio comes from California orchards. 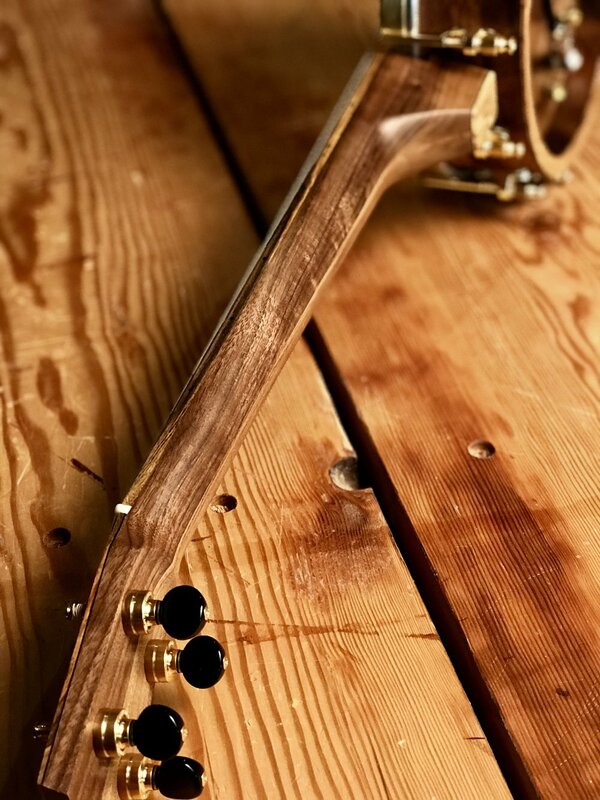 To me, the Japanese concept of Wabi-Sabi applies to my instruments in three ways. 1) Aesthetically: Muted natural colors, smooth but variable textures, a celebration of unique flaws and inclusions and a reverence for natural materials. 2) Philosophically: The idea that nothing is perfect. What makes you flawed is what makes you unique, beautiful and worthy of celebration. 3) Temporally: The idea that objects change over time with use and weathering of age. The evidence of its use is seen as beautiful. 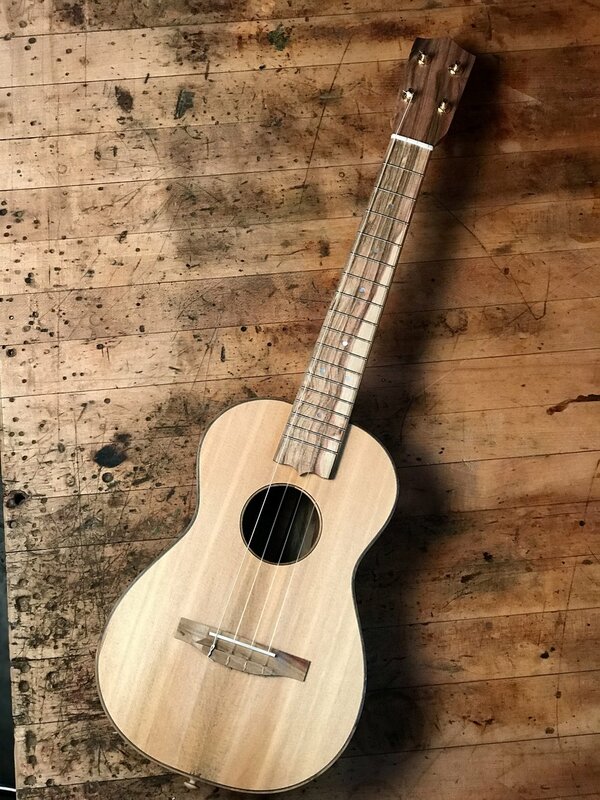 The owner of this uke, Peter, told me he wanted mahogany and he liked Wabi-Sabi. He left the rest up to me. 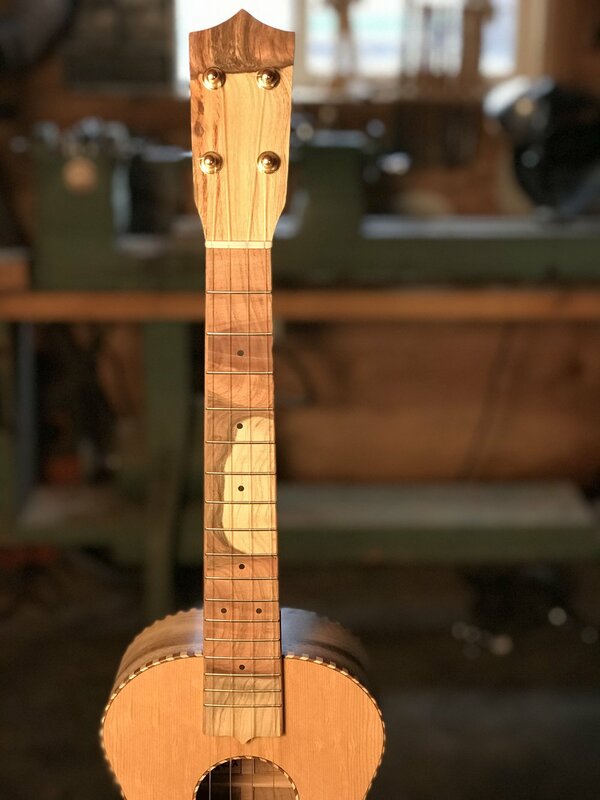 I chose an amazing set of figured mahogany with dozens of tiny bug holes from the Carpenter ant stash for the body, some straight grain mahogany for the neck and some simple, muted pistachio for the fretboard, binding and trim. But, viewing the instrument from 10 feet away is completely different than up close. 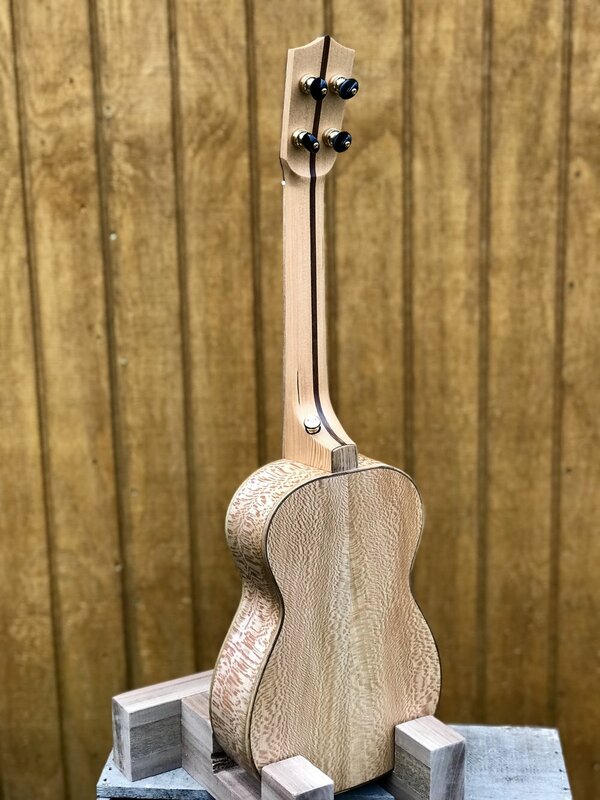 When you zoom in, the mahogany grain pops, the book matched bug holes show up and the “plain” pistachio show off tiny variations and color changes. 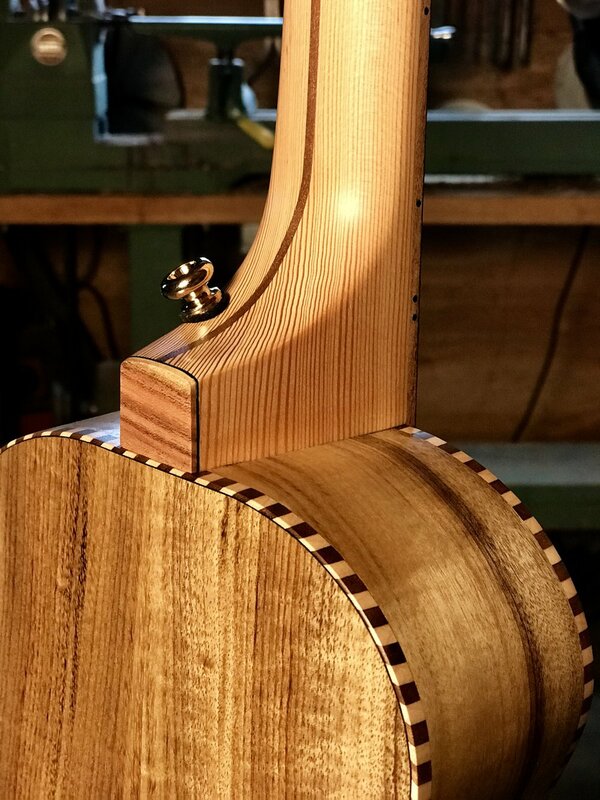 Most notably, there is a bug hole that grazes the lower bout in an amazing feat of wood boring. 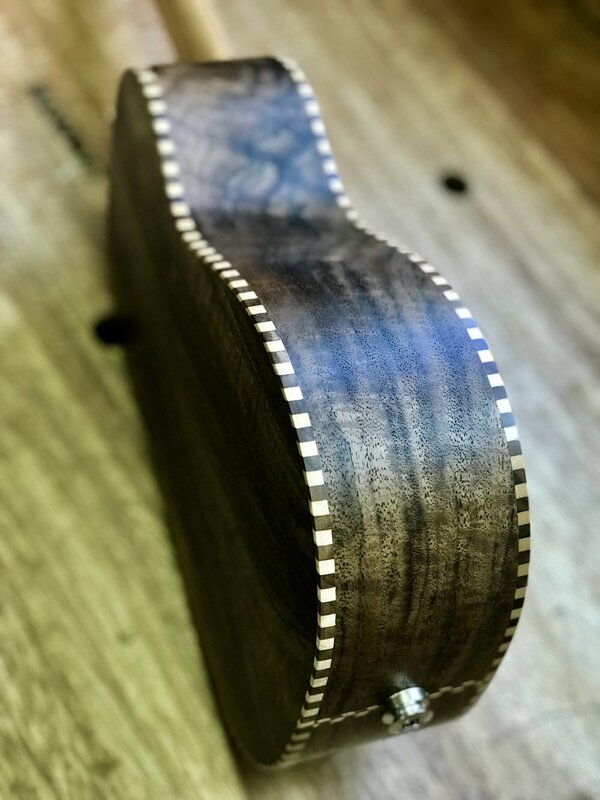 It wasn’t visible when I bent the sides, but showed up when sanding. I see it as a happy accident to celebrate and a reminder of the chaos of the world intruding on our daily work. We can embrace it or scream about it, it’s up to us. 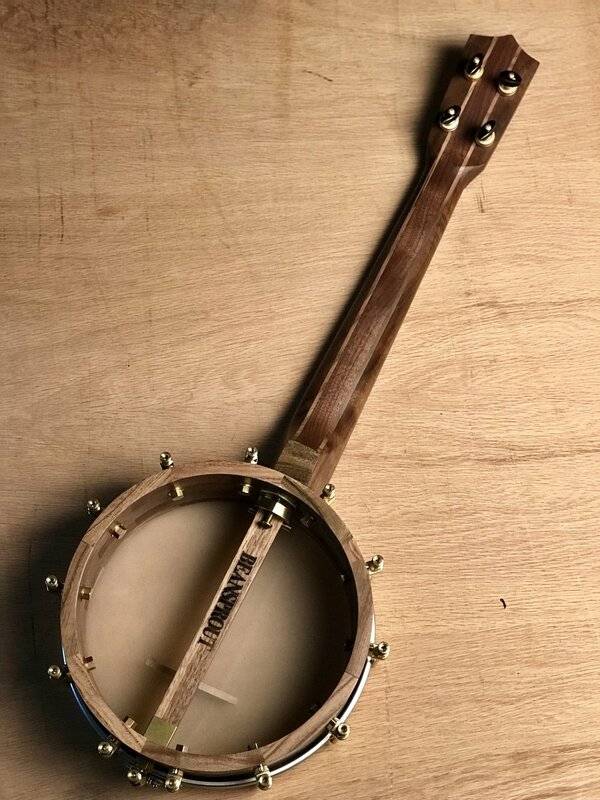 This is just a solid example of what makes my little banjo ukes so nice. They can be loud or soft, sweet or rich, brassy or mellow, all depending on your touch and your imagination. 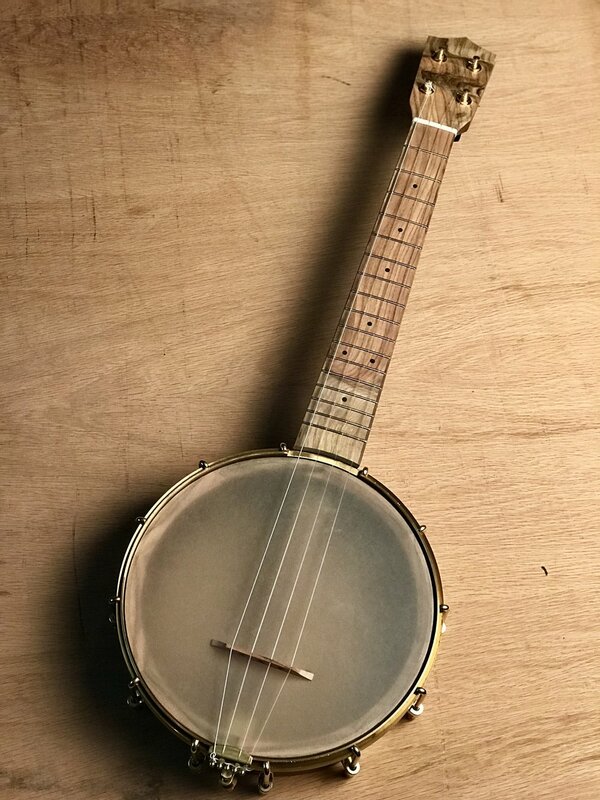 From the beginning, the best compliment I’ve always gotten was: “It's a banjo uke, but it doesn’t sound sh##ty!” Truth. 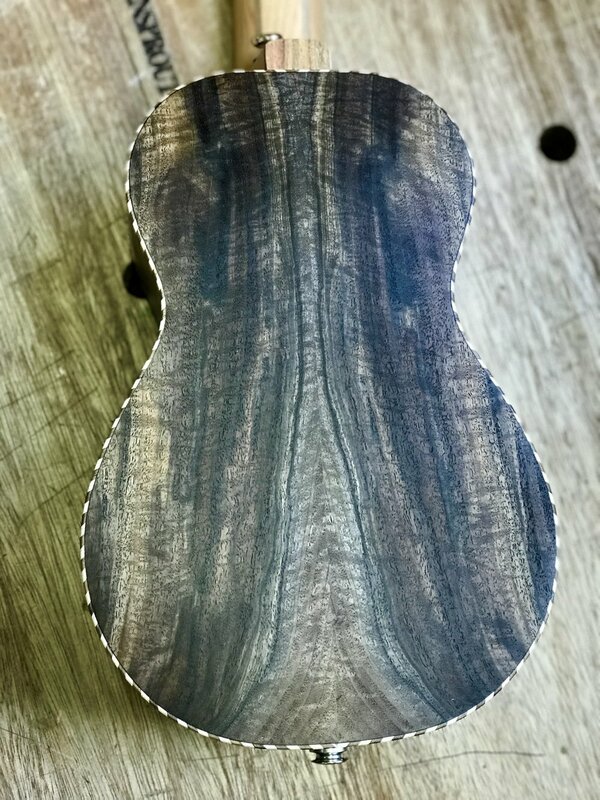 Two color, slightly curly Oregon walnut from Goby. 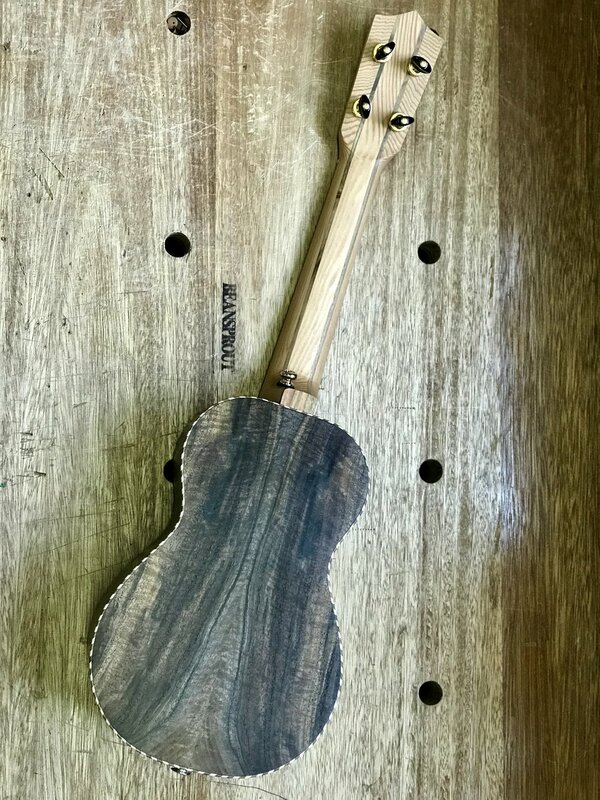 Pistachio from woodfromthewest.com. Ready for service. One concept I am interested in at the moment is rhythm. 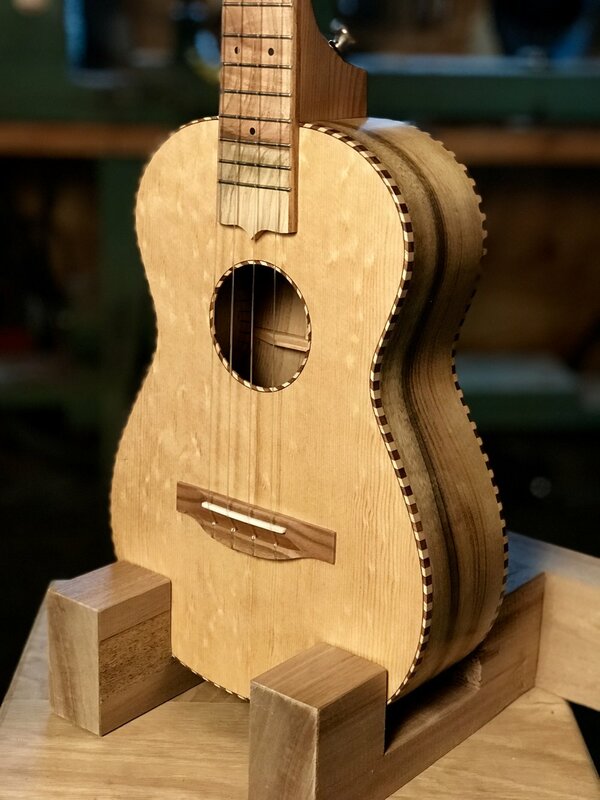 Not in music, but in the shop. Yes, I can make a nice thing, but can I make it every day a little better and not get bogged down in the repetition of it? Can I rejoice in repetitive tasks? Can I keep my sense of wonder and play while trying to earn a living? 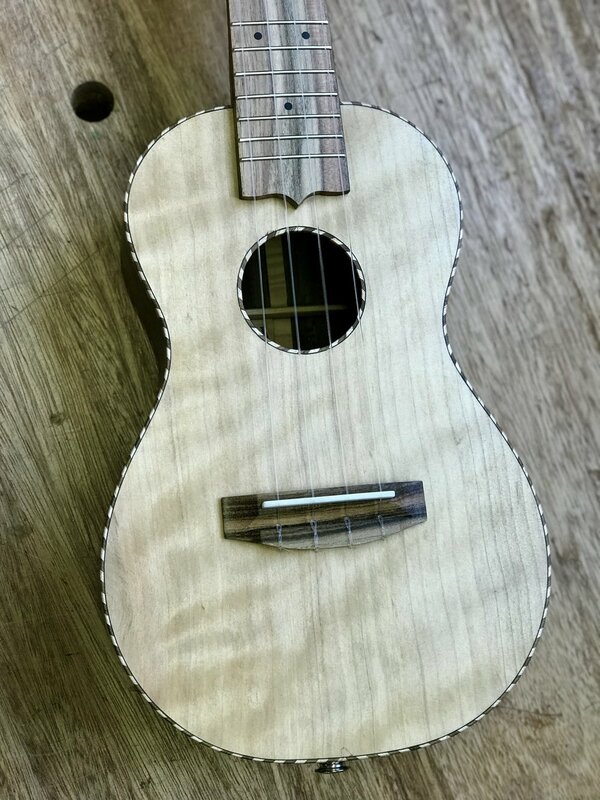 Can I allow every shop day to be a little different, even as I hone the ukulele making process down to its most important steps? Can my mistakes inspire me instead of defeating me? None of these questions can be answered except by me and over time. In the meantime, this happens. 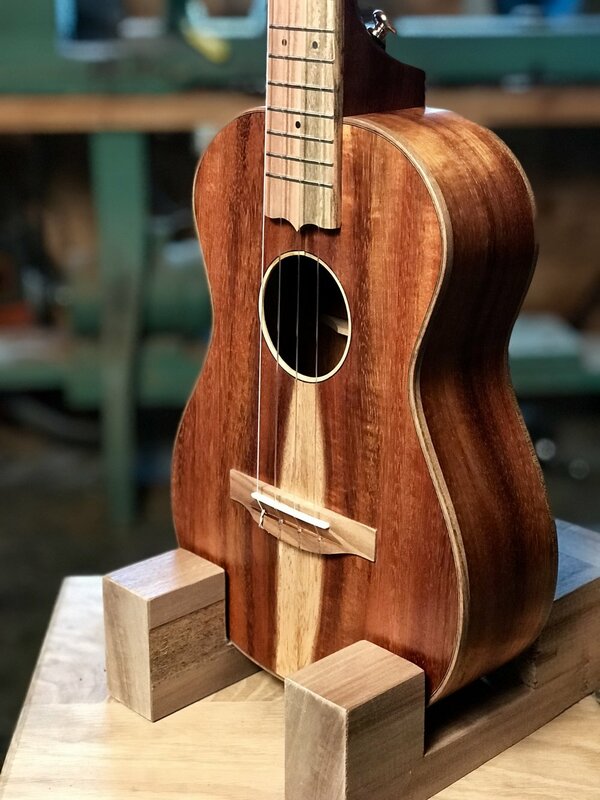 A beautiful tenor ukulele pops out. It is a thing unto itself, but also a single data point in a craftsperson’s life. Sort of like light being both wave and particle. 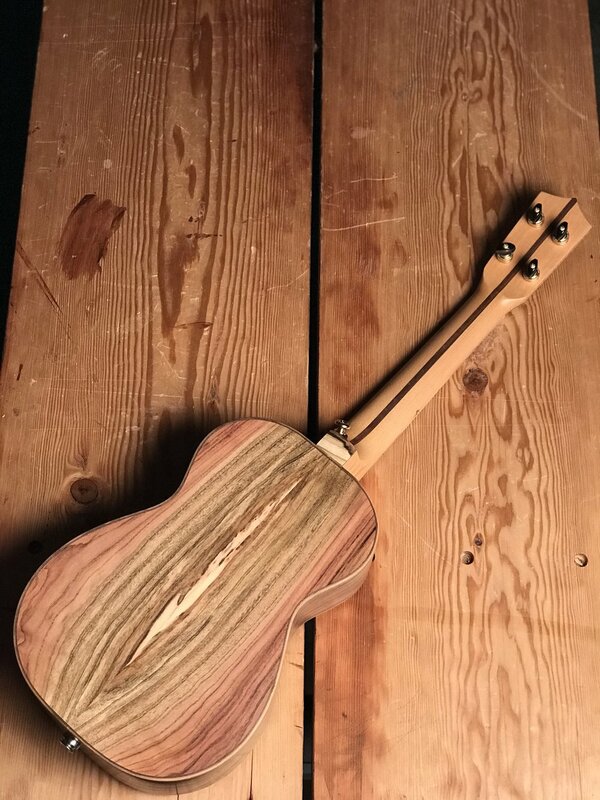 Speaking of wave, check out the beautiful wavy, curly, dark lined figure of this Oregon myrtle from woodfromthewest.com. 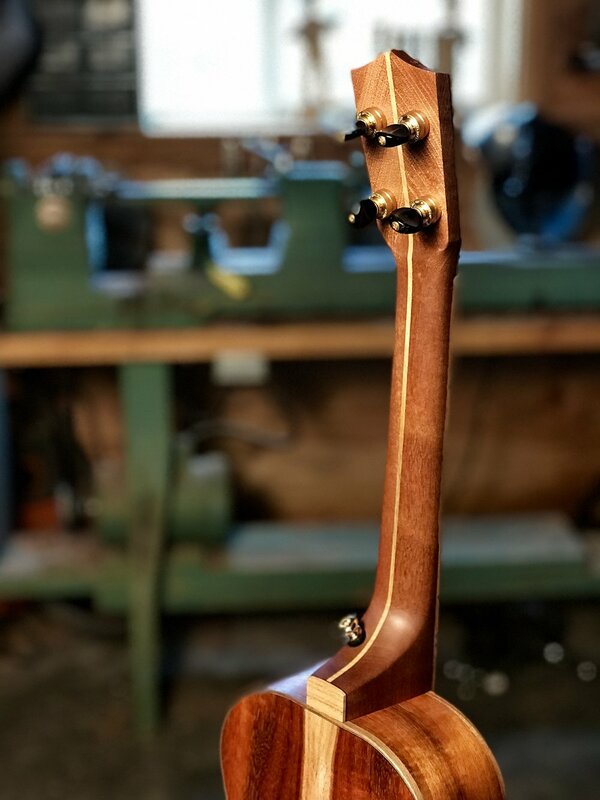 Speaking of particle, check out the filled nail holes in the salvaged floor board fir neck. 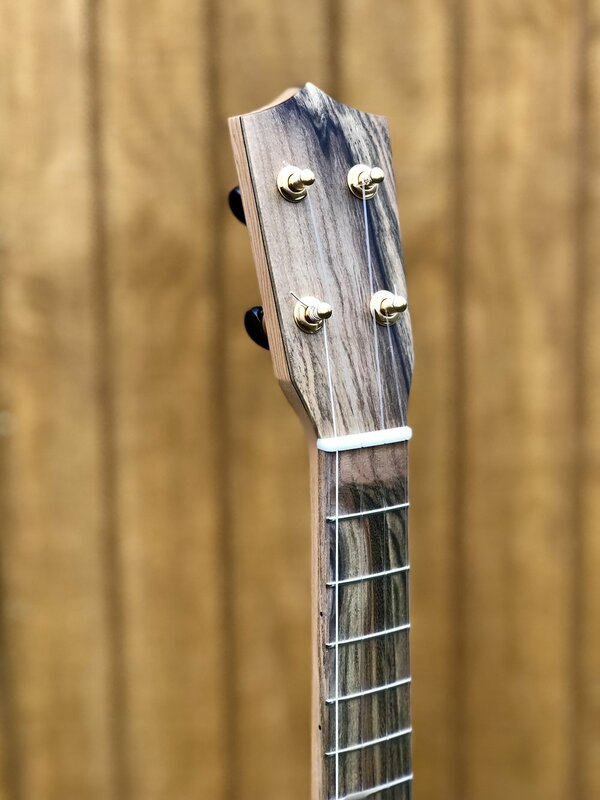 The pistachio fretboard, headplate and binding are the prism revealing a rainbow. I can find the flaws and they push me to do better. You take it and make your own art with it, I’ll be back in the shop starting a new one.